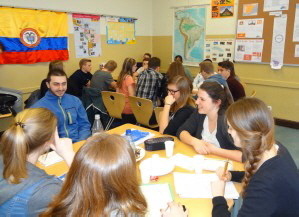 Goethe-Gymnasium Nauen - Englisch-Projekt "Multiculturalism"
Over the past weeks we have been talking about multiculturalism in our English classes. 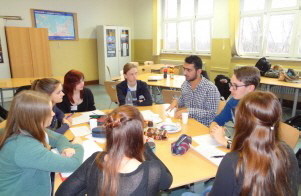 Matching with the topic, Mr. Schadow organized a meeting with refugees on the 9th Feburary 2016. We formed groups and prepared some questions for the interviews and a tour of our school. On Monday, 15th February 2016, a refugee named Nehad Zin Aldin visited us in our English class. He is 24 years old and has lived in Friesack for four months. Before that he lived in Syria but because of the war he had to leave. We expected Nehad to be shy and that he was not able to speak English that well. He actually talked very much and told us about his brothers, one lives in Germany and the other one in France. Although they were able to flee, they had to leave their mother and father behind. When he still lived in Syria, Nehad studied IT to become an engineer and played basketball in his free time. He told us that our school was “big and beautiful“ in comparison to his old one. There were only five rooms and 100 students. In Friesack, he tries to learn German but it is very difficult for him. Despite that he is very ambitious and soon wants to earn some money. Currently he is working in a kitchen. In the refugee`s hostel live about 100 people and he has his own room with a TV. From what he has seen so far he does not like Germany that much, for example, because of the weather. Another point is the traffic in Berlin and the stress that everyone has. On the other hand he feels that Friesack is way too quiet and there are no people on the street. Nehad is also ashamed because of the looks he gets from other people for not being German. In the end we had a really nice conversation with him about his life here but he also told us kind of sad things about the war and that he misses the rest of his family.